First Sentence: Pere Don Callahan had once been the Catholic priest of a town, 'Salem's Lot had been its name, that no longer existed on any map. For a spoiler-free review of The Gunslinger, look here, and for a spoiler-free recommendation on the series, read the following sentence. King doesn't manage to finish what he started in the early books, but if you allow him that, it's still an enjoyable ride. On to the review proper. 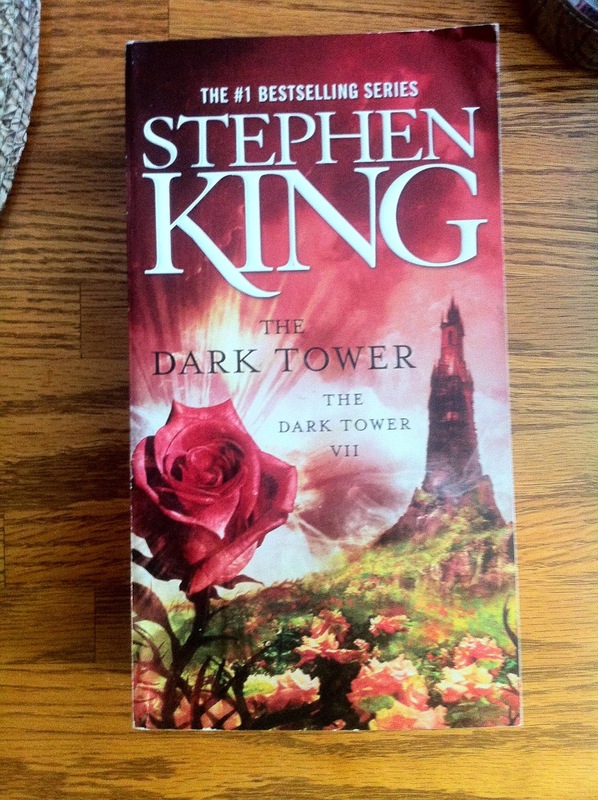 To begin, The Dark Tower is quite long. It's not really the length that its 1030 pages imply—the font is biggish and the pages small, and the prose zips with characteristic Stephen King speed. Still, although I often forget what was going on at the beginning of a book by the time I reach the end, I was astonished to realize everything that happened in this one as I flipped backwards through it. In my review of The Gunslinger, I called that book an introduction but didn't mention that it's also a collection of parts rather than a real whole. This book is the same sort of thing, basically just a whole bunch of set pieces strung along the road to The Tower. I suspect that many road novels have that characteristic. If I remembered more about Augie March, this would be a good time for a comparison. This might also be a symptom of what I'm going to call Late-Series Decay, wherein a book that comes late in a series simply loses its ability to function as a self-contained narrative without summarizing all the books that came before. Nevertheless, the Gunslinger, Roland, is still a wonderful romantic character. I'm not sure King's really done him justice over the full course of the series but he got a Crowning Moment of Awesome (verbum sapienti, that link will take you to TV Tropes) toward the end of the book that wrung a couple of tears out of my eyes. This may not be the novel that Roland was journeying toward at the end of The Gunslinger, but it's the one he ended up in. There are a lot of other well-realized characters as well, and what I forgot to mention earlier about the set pieces is that many of them are very exciting. Because it's hard to structure a review of a series (Late Series Review Decay? ), I'm going to end this review here and finish up the discussion in my post about the overall series. "You could help me by shutting up," Eddie said, and the grill spoke no more. He found himself wondering if he had offended it, then wondered if perhaps he should kill himself and spare the world a problem.